Talented musicians from the Oberlin Conservatory of Music and Bethesda-on-the-Bay Lutheran Church will present a holiday concert at 4 p.m. on Sunday, Dec. 9, at Bethesda-on-the-Bay Lutheran Church, 24607 Wolf Road. 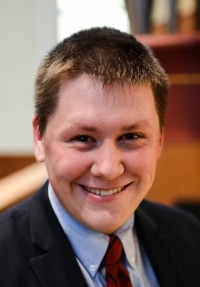 The concert will feature Matthew Dion, a native of Somerset, Massachusetts, and an undergraduate organ performance major at Oberlin College and Conservatory. Matthew is a recipient of the YOI (Young Organists Initiative) Scholarship from the Boston Chapter of the American Guild of Organists. Matthew is the organist at Bethesda. Oberlin students Elizabeth Zak, soprano; Abby Orr, soprano; and Katherine Krebs, mezzo-soprano – all members of Bethesda’s choir – will sing vocal solos. There will be other organ, solo and choral selections of the season from Oberlin musicians, the Bethesda choir and its members, as well as an audience hymn sing. A freewill offering will benefit the cleaning and restoration of Bethesda’s Casavant pipe organ, which was installed in 1987. Free-lance writer and public relations consultant.